Agile describes a set of guiding principles that uses iterative approach for software development, while Scrum is a specific set of rules that are to be followed while practicing the Agile software development. Agile management represents various o software-development methodologies that have been influenced by iterative and incremental development, which includes Extreme Programming (XP), Rational Unified Process (RUP), Scrum, and others. Agile process or methods provide an environment where there is constant evolution in requirements and evolution as a result of collaboration between self-organising cross-functional teams. Agile methodologies foster a disciplined project-management approach that encourages a set of best practices, allowing a rapid delivery of high-quality software and enhancing a business approach, which aligns development with the customer needs. 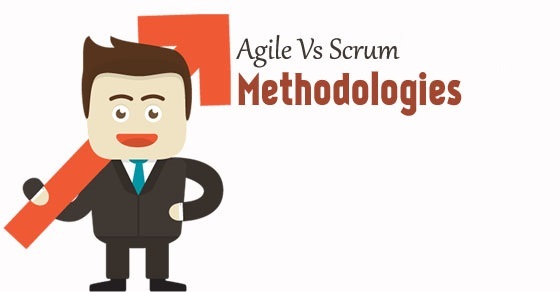 The Agile methodologies stand in contrast to the traditional waterfall methodology, where all the requirements are initially analysed and documented before the development begins. While in Agile approach, requirements are like the actual software-development advances within each iteration. This approach provides flexibility in accommodating changes in the requirements and priorities of the business. In the traditional waterfall model, the high-value features are developed and delivered in longer cycles compared to the Agile approach, which enables delivery within short cycles. This enables the vendors to be more responsive to the development requests of the customers. Adopting Agile benefits the vendors by having an improved customer satisfaction and customer retention, leading to more customer contacts through positive references. The Agile allows the vendor’s focus to be on the development effort of high-value features, decrease the overheads, and improve efficiency. With Agile development, there is a regular inspection of the working product, with testing integrated at every iteration, as it develops throughout the lifecycle. This in turn retains the quality of the product and also allows the product owner to make necessary adjustments whenever a quality issue arises. Agile methodology is a collaborative approach that encourages active user participation throughout the product development. This gives an exceptional and clear visibility of the project’s progress and product development to the stakeholders. Agile development process has fixed timescale where the requirements emerge and evolve as the project progresses and the product is developed. This enables a fixed budget. In Agile methodology, small incremental releases are made visible to the product owner throughout the development cycle, which helps identify issues at an early stage, and it makes easier to respond to change, if any. Agile development ensures clear visibility, which allows necessary decisions to be taken at the earliest possible opportunity. 1. Product Owner: The major responsibility of the product owner is to maximize the value of the product and work of the development team. Additional duties include managing the product catalogue. 2. Scrum Master: The development team consists of self-organising professionals who turn the product catalogue into product increment at the end of each sprint. 3. Development Team: The Scrum Masters make sure that the Scrum team is abiding by the Scrum theory and its rules. In the traditional waterfall model, when the business and technical requirements are documented and detailed, it results in endless documentation. The Scrum makes use of user stories to describe the functions needed to be developed. A tool called Pivotal Tracker is used to store these user stories in a backlog. If a change needs to be made or a need arises to add to the user stories, in that case the team can adjust as early as the next sprint. This allows the business to change their minds and the development team to be flexible enough to adjust to those changes. The ability to accommodate change is a powerful attribute of the Scrum methodology. 1. The Product Owner, the Scrum Master, and the development team work closely on a daily basis. 2. Sprint-planning meetings are conducted, which allows the development team to organise its work based on the knowledge gathered from the business priorities. 3. Conducting daily scrum meetings where the development team can account for the work completed, its future prospects, and deal with issues if any. 4. Conducting sprint reviews allows the team members to evaluate their former work by recommending better practices with every sprint. Fantastic web site. A lot of useful information here. I'm sending it to some friends ans additionally sharing in delicious. And obviously, thanks to your effort! You are so interesting! I don't think I've truly read through something like this before. So great to find somebody with some genuine thoughts on this topic. Seriously.. thanks for starting this up. This site is something that is needed on the web, someone with a bit of originality! You actually make it seem really easy along with your presentation however I in finding this topic to be really one thing which I think I might by no means understand. It seems too complex and very wide for me. I am looking forward for your subsequent post, I will try to get the dangle of it! Hi Enoch Dwose We can provide you mail ID details, editor@knowledgehut.co You can subscribe us for more posts. Have you ever considered about including a little bit more than just your articles? I mean, what you say is fundamental and all. But just imagine if you added some great visuals or videos to give your posts more, "pop"! Your content is excellent but with pics and video clips, this blog could definitely be one of the greatest in its niche. Amazing blog!